Notes: Based on the visual novel developed by 5pb. and Nitroplus, originally released for the PC. A X-BOX 360 port has also been announced. There are also three manga adaptions. Takumi is a despicable otaku. He lives by himself, skipping school to play MMORPGs and obsess over anime all day long. He's never really lonely- his imaginary girlfirend, a magical girl named Seiru, keeps him company, telling him over and over that his lifestyle is the best for him. "Nobody understands you but me. You don't need anybody else." His only contact with his family and the outside world is his little sister, who seems concerned over her onii-chan's slippery grip on reality. As he immerses himself further into the 2D world, she's is losing hope that he will ever grow up. But while surfing the Net, Takumi is sent a link from a stranger on the Internet. The link has pictures of a gruesome murder in an alley, with the stranger telling him this is part of recent chain of serial killings. Takumi doesn't believe the stranger, since no one on the Net or on TV has reported the killing. Takumi assumes the pictures are a practical joke... until he stumbles across a young school girl killing a man in a dark alley just as the photos pictured. He manages to escape, but now he's convinced that a conspiracy is out to get him. Pretty girls from school and elsewhere have started to take an interest in him... and one of them look exactly like the murderer. There's a small number of things I like to see in anything I watch. I want good characters, a smart script, and an interesting plot. I also like seeing something ambitious, something that's different or tries to give an opinion on some social ill. On the face of it, Chaos;Head looks like that kind of show. It's based on an innovative Japanese visual novel. It's animated by Madhouse, who is still one of the best studios around. And the plot sounds like another Welcome to the NHK or Ressenitment; something that takes a hard look at the seedy side of otakudom. And maybe Chaos;Head wanted to be all of these things. But it's so boring, so convoluted, and so confusing that any impact its characters and story could have had is lost in the clumsy execution. It started out fine. Takumi is an interesting bloke- a guy who is so out of touch with reality that he complains to his delusion that he's suffering from delusions. He's a dirty, ugly son of a gun with no apparent social life, and no real interest in one. But he's a good character. Some people have the mistaken impression that character needs to be likable or heroic to be "good," but that ain't necessarily so. They just need to be interesting, and like other characters- Yu Goto from Noein and Light from Death Note come to mind- Takumi is a fascinating basket case who can carry the entire anime by himself. Or at least for the first three episodes, because things get out of hand very quickly. Takumi already clearly suffers from delusions, which throws into question how real anything we're seeing is. The story starts off precariously balanced, because we never get a clear idea of how much we're being told is actually true. In the hands of a hack director, this could easily devolve into a real mess. Who'd you say directed this? Takaaki Ishiyama? Never heard of him. What other anime has he done? ... Spider Riders, you say? Sakura Wars? Viewtiful Joe? Oh crap. We are so screwed. The problem with Chaos;Head is that every time it tries to up the ante, it only creates more confusion. A common misconception about suspense is that it means to keep the viewers in the dark. But nearly the opposite is true- you explain just enough of the mystery to keep things interesting. The narration should be a guide, not a riddler. Chaos;Head doesn't guide the viewer at all- it stumbles from one weird mystery to another, and then another, and then another. It creates an ungainly tower of half-baked enigmas that have little explanation beyond that Takumi is a very screwed up kid who might be a very screwed up city's only hope. And when the anime does try to explain much of anything, it starts coming off as a really boring Oshii wannabe whose only experience with philosophy are repeated viewings of The Matrix. I don't think it's clear to even the scriptwriter what the hell was going on. And whereas Oshii's musings are usually accompanied to beautiful imagery, the animation in Chaos;Head is stale from beginning to end. It's a black mark on Madhouse's usually stellar record. Later on in the series, we finally see some guidance. Apparently a lot of the mystery comes back to an evil corporation- doesn't it always?- that has been experimenting with virtual reality technology. The story seems to be getting to an old cliche: the world that everyone sees isn't real and only a few gifted people can see through the lies and thereby save humanity. If that's how it turns out, it would be a big disappointment that something that seemed so ambitious would end with something so stale. "Well," you ask, "why don't you just watch the rest and see if it does?" Because after eight episodes of growing confusion and frustration, it's clear that I can find plenty of better ways to spend two hours. Recommended Audience: Some violence and creepiness means this is a best fit for teenagers and up. 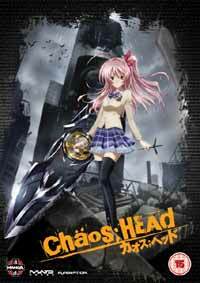 Chaos;HEAd © 2008 Madhouse Studios, IMAGIN Entertainment, Nitroplus, The 5pb.